mastered the art of gold plating, only to find that his true calling lay in giving a golden touch to the divine. IT IS ON THE AUSPICIOUS DAY OF Dhanteras that I have a tête-à-tête with Pankaj Bhandari of Smart Creations, a company that specialises in gold coating services—with a spiritual touch. But that is today. Back in the 1990’s, Bhandari, who then was a commerce student, was balancing the world of academics and moneylending: he would help his father, who was in the business of moneylending through the day, while also trying to understand the nitty-gritty of the stock markets and IPOs, and by evening, he would don his student hat and attend college. That, he explains, helped him acquire the fundamentals of accountancy, human resources and business ethics. 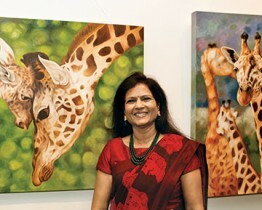 The Bhandaris, who trace their roots to Jodhpur, Rajasthan, have been settled in Chennai for many years. By 1996, Pankaj Bhandari was engaged to Kala Kumbhat. Post engagement, his father–in-law-to-be, who had a thriving outdoor lighting business, suggested that he put up a gold electroplating unit, as it had great potential. Borrowing a sum of R30 lakh from his father, Bhandari, accordingly, went ahead and turned entrepreneur, setting up his first gold plating unit under the banner of Smart Creations, in the Ambattur Industrial Estate of Chennai. His initial orders came from luxury hotels that needed their hardware fixtures—these included lamps, light fittings, door-knobs and even cutlery—to be polished or lacquered for their lobbies and Presidential Suites. Though orders had started coming in, Bhandari wasn’t satisfied and wanted to grow. That one order and job changed the course of his business entirely. He realised that there was huge potential in retail business. It was also very challenging because while the hardware fixtures were structurally plain and were more or less similar to one another, the idols were more delicate and they tended to be a matter of pride and sentiment for the owners. Bhandari then decided to upgrade his knowledge on the subject and acquired in-depth training in Mumbai and UK in electroplating and lacquering techniques. He began to integrate traditional practices such as the lost wax process with modern technology, to arrive at 24-carat gold-plating solutions that would be uniform, durable and measurable. 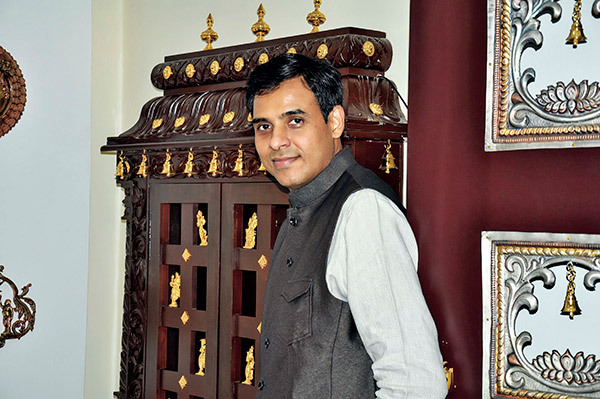 “Despite being a Swetambar Jain, who had never practised idol worship in life, I would now look at every idol that came our way with great obeisance and reverence,” says Bhandari. As luck would have it, word spread and he received a request from his very own Ambattur Industrial Estate, to attend to a Balaji temple, which virtually opened the doors of the world of temples for him. He then went on to divide his services under two brands: Pon Alayam for temples and Pon Illam for homes. In a little over a decade, Bhandari and his team have attended to countless home deities and idols as well as 3,600 temples. They also have three showrooms now: one in Hyderabad and two in Chennai. The noteworthy temples in his repertoire include Sri Oppiliappar Temple in Kumbakonam, Sri Parthasarathy Temple and Sri Anandapadmanaba Swamy Temple in Chennai, ISKCON Temple in Bengaluru, Sri Badrakaliamman Temple in Sivakasi and Sree Ayyappa Temple in Sabarimala. One of the most challenging projects that has been successfully undertaken by his team was in Patna, where they worked on a 13 ft statue of Lord Hanuman that was mounted at a height of 100 feet. The project received rave reviews and appreciation. His wife Kala, who is a trained interior designer, is presently working on creating contemporary art forms using the electroplating process, and his two daughters are desirous of joining their father’s business at some point. He half-jokingly advises them to study chemistry—something he never did, but instead only picked up skills and knowledge as he went along. His father, of course, has wound up his moneylending business long since to join his son’s golden journey. “Trust is one of the biggest factors of our business. By God’s grace, we enjoy immense trust, both from our customers as well as from our artisans and craftsmen,” says Bhandari. Having built a luminous enterprise for himself, he aspires to someday set-up a college of Indian arts and handicrafts that would skill and train women. He also dreams of providing guidance to leading start-ups, once he hangs up his boots at 55. “Perhaps what has been one of the most rewarding aspects of my work is that it has allowed me to travel to countless temples, learn to appreciate the science of a temple and imbibe the positive energy that resides in each. It has made all of us appreciate Indian art and architecture better and has even made me more meditative,” concludes the man with the Midas touch.